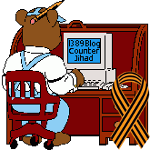 #Caturday, February 6, 2016: Wily fox steals cat’s meal — 1389 Blog - Counterjihad! This regular cat was no match for a clever fox, who taught the feline a thing or two about the pecking order. Believed to have been filmed in snowy Russia, the wily fox was watched by an amused passersby as he flung the cat to the wayside so he could tuck into the kitty’s meal. The cat did at least attempt to ward off the fox, before resigning himself to the fact that it wouldn’t be sharing a meal with the wild animal anytime soon.